The Royal Mint released 300 million new one pound coins into circulation on Tuesday. The money’s packed with cutting edge anti-counterfeiting measures, including one that British authorities won’t even talk about. Is it a coincidence that this happened the day before British Prime Minister Teresa May triggered the UK’s exit from the European Union? Probably. The new bimetallic coins are slightly slimmer and lighter than the old one-pound coins and feature a 12-sided edge, alternating between a milled surface and a smooth one, that makes it easy to identify in your pocket. The front side shows Queen Elizabeth’s fifth coinage portrait, while the back side sports the image of a rose, leek, thistle, and shamrock (symbols for England, Wales, Scotland, and Northern Ireland, respectively) connected to stalk growing out of a crown. As with other British coins, the image on the back will change when new coins go into circulation. But what really sets the new pound apart is the anti-counterfeiting features. First, there are tiny inscriptions near the edge of the coin, cut into the metal using an expensive laser cutting tool that the average crook would have a hard time getting their hands on. The front side of the new coin also features a so-called “latent image.” Using a lenticular, hologram-like effect, the raised surface of the coin reads “1” when viewed from one direction and “£” when viewed from the other. The marquee security feature, however, is much more elusive. The Royal Mint won’t say much about the feature except that it enables special machines to read and verify the authenticity of the new coins. The mint also says that similar technology is already in use on some banknotes. Some theorize that there could be a tiny RFID or NFC chip embedded beneath a thin later of metal that sends a cryptographic signature to the machine. (This seems somewhat feasible, since Saudi Arabia has been working on embedding RFID chips into its paper currency for a few years.) Another possibility is that there’s simply a layer of a specific kind of metal that changes the conductive or magnetic properties of the coin. Regardless of the secret, the Royal Mint seems very confident that they created a coin that simply can’t be copied. If true, this could help get many millions of fake one pound coins out of circulation. The Royal Mint says that one in 30 pound coins currently in circulation is fake, which is a little mind-boggling if you consider how much work goes into minting coins. 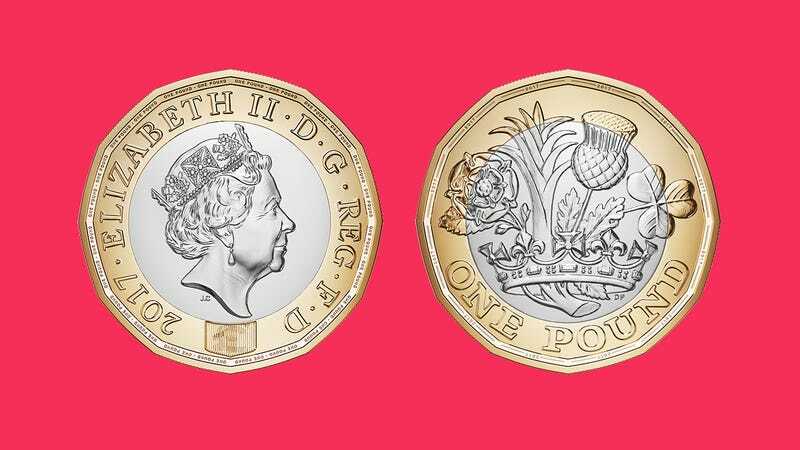 The new pound coins entered circulation on March 28, and the old pound coins will start to be pulled out of circulation on October 16 of this year. But it will only be a matter of time before some enterprising YouTuber decides to saw one of these new puppies in half to see how that mysterious new “high-security feature” actually works.